I can’t remember the last time, if ever, I strolled down Half Moon Bay’s Main Street. In recent years I’ve popped into the Ritz Carlton on the cliffs, have had the occasional lunch near the beach and visited one of the two large nurseries to pick up ceramic flower pots for my backyard but it had never occurred to me to check out the historic downtown area. After many years of just passing through on my way home from the coast, I finally spent a leisurely afternoon last week becoming acquainted with Main Street. Because of the absence of the weekend crowd parking was easy. Several shops drew me in and I took note of a few restaurants that I might drag my husband to sometime. There were a couple of housewares stores–one in particular, Toque Blanche, grabbed my attention then held me hostage for the next half hour. Everywhere I turned I found something I “needed”, from essential cooking tools to Italian ceramics and even handmade rolling pins. When I discovered their alcove with a fine collection of cookbooks at the back of the store I vowed to return for some Christmas shopping but didn’t wait to snag two books for my own collection. It was about tea time when I decided to make my way home. Conveniently, Moonside Bakery & Cafe was right next door. Despite the inviting array of freshly baked pies I knew that the Almond Horns would be accompanying my cup of tea as soon as I spotted them. The owner of the European-style bakery is a Certified Master Pastry Chef and most of the breads, pies and pastries are made on the premises. The almond horns (aka almond crescents or mandelhörnchen in German) were an A+ in my book. With an almond paste base, the little cookies were slightly crisp outside and soft and chewy inside. Not overly sweet, I inhaled the chocolate-dipped treat in no time. Determined to recreate them for the holidays, I became obsessed with finding guidance on the web. The almond horns didn’t happen because of a shortage of sliced almonds in my pantry so I considered making a cookies instead. The ingredients are very simple–even making your own almond paste like I do–you need mainly almonds, egg whites and powdered sugar. How fortuitous it was to find the very type of cookie I wanted to make as I leafed through one of the cookbooks I bought at Toque Blanche. 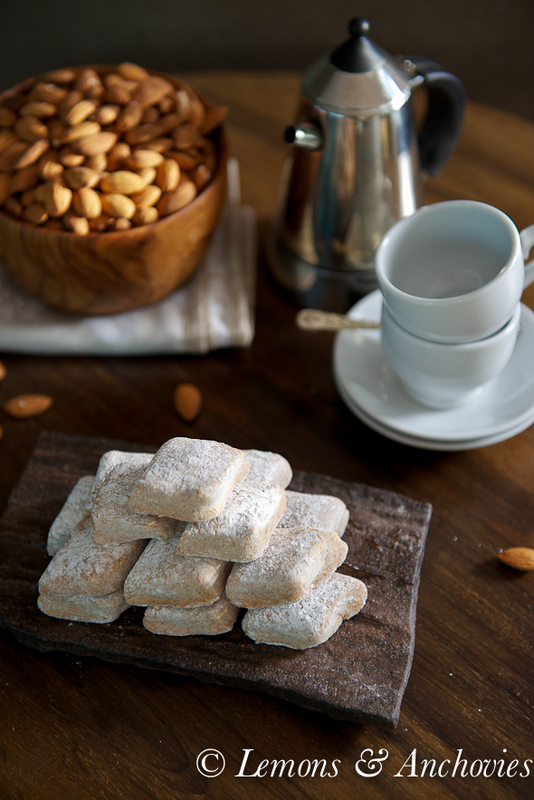 Ricciarelli are Italian almond paste-based cookies that date back to 14th century Siena. They were regarded as a treat for the nobility because of the expensive ingredients, almonds and sugar, and were often served alongside dessert wine. Over time they became a Christmas tradition but these days they are a common offering in Italian sweet shops. The tops should be more crackled according to web images of the same cookie and I understand now that it’s because I might have used a bit more flour to work with the very sticky dough. I know how to avoid this next time but this version is no slouch at all. I used my homemade almond paste and added more almond meal to my version but otherwise I stuck to the recipe. A bit crisp at the bottom and soft on top and inside, these ricciarelli were not sweet at all but were rich with almond flavor–exactly what I was after. Next on the to-do list, Almond Horns…and a return to downtown Half Moon Bay. Ricciarelli are Sienese almond paste cookies dating back to the 14th century. 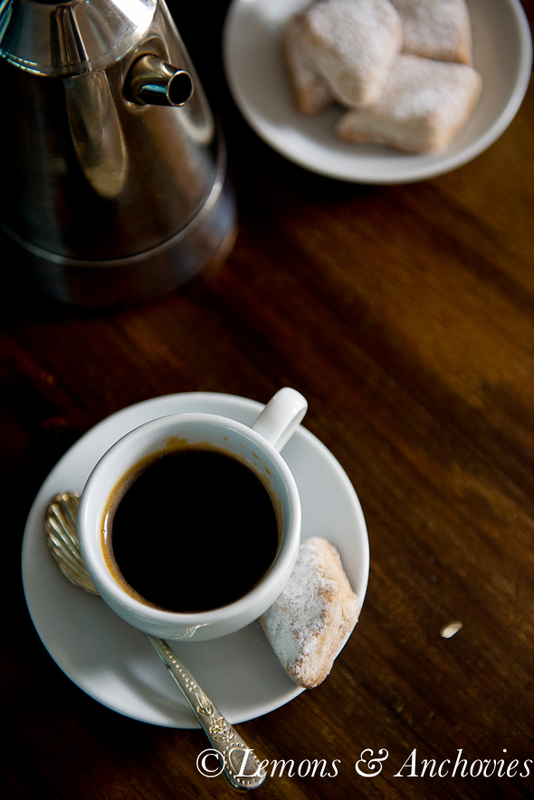 They were most often served with dessert wine but who says you can't have them with tea or coffee? If you make your own almond paste, use a food processor to finely grind the almonds. It may take about 2 minutes before you have the right texture--you want the ground almonds to be smooth but before they expel their oil. Stir the ground almonds together with the remaining ingredients, powdered sugar, egg whites almond extract and kosher salt. Set aside. To prepare the cookies: Using a stand mixer fitted with the paddle attachment, combine the almond paste with ⅔ cup of the ground almonds (or almond meal) using the low setting. Add the egg white and mix again until well blended. Finally add the baking powder and vanilla extract and process until blended again. The dough will be very sticky. If it looks too wet, add the remaining ⅓ cup almond meal. 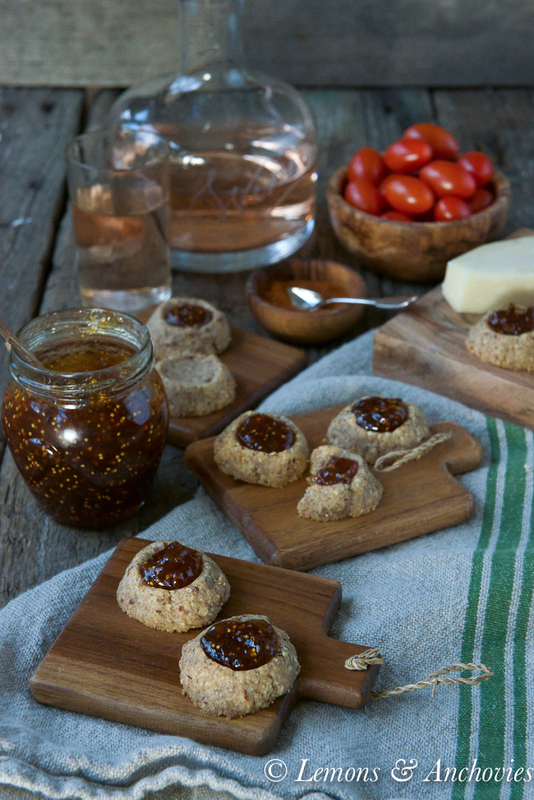 I used a full cup of almond meal in this recipe. Lightly flour your work surface and scoop out the dough from the mixing bowl onto the counter. You might need to sprinkle additional flour on top of the dough so you can work with it. Form the dough into a ball and divide in two pieces. Roll each piece into a thin log, roughly ¾ - 1 inch in diameter. Cut the log in 1-inch pieces, sprinkle the tops with powdered sugar. Flatten the top of each piece and form into a diamond shape. Repeat with the second piece of dough. Transfer the shaped pieces of dough on parchment-lined baking sheets. Leave to rest for a minimum of one hour to overnight. To bake: Preheat your oven to 300℉. Bake the cookies for 20 mins, rotating the baking sheets halfway through the cooking time. Don't let the cookies get too brown or crisp--the idea is to keep them soft. Cool on a rack before serving. Recipe adapted from The Italian Baker (Revised) by Carol Field. I had to improvise on this recipe because following instructions didn't give me the results I was supposed to get. The range for cooking time was very wide but the low end of the range worked for me. Prep time includes 1 hour wait time before baking the cookies. I’ve always wanted to try Ricciarelli, these look lovely! These are gorgeous. 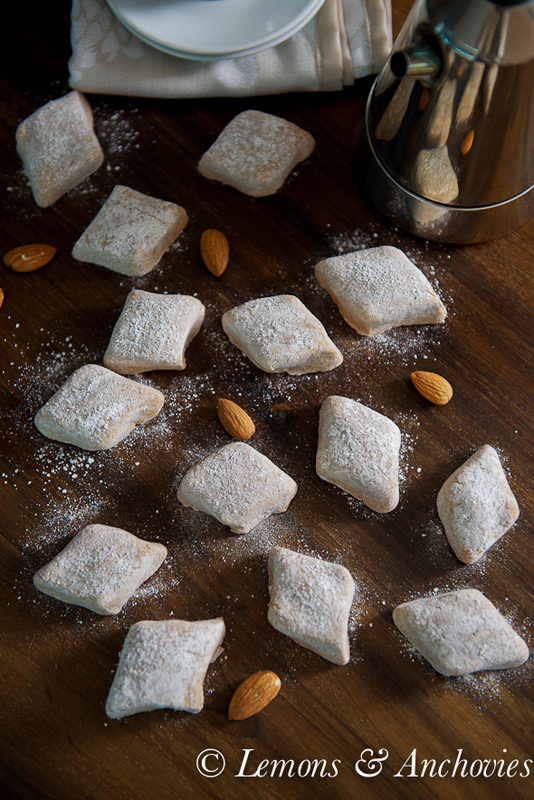 I love almond flavored desserts…and especially those made with almond paste. They look so lovely too! 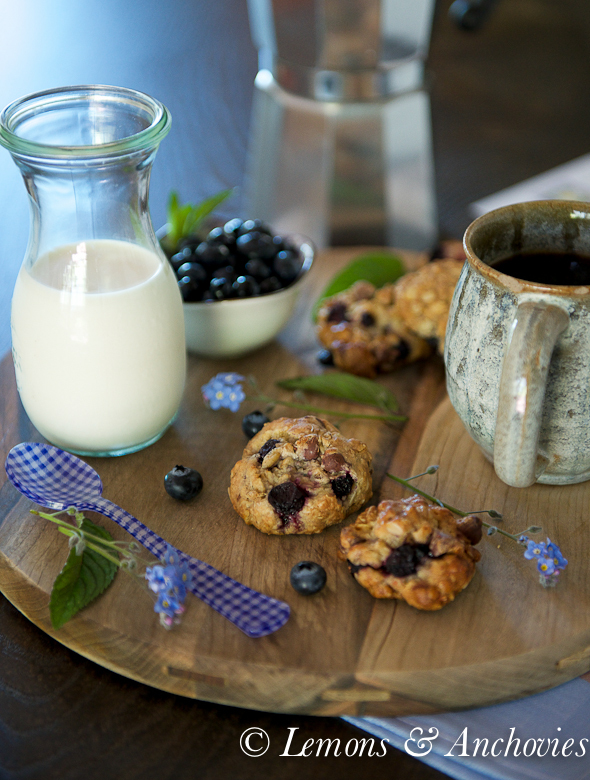 This is just sweet and simple cookies and nutritious too. Thanks for sharing this one with us. Jean – these cookies look like they would simply MELT in your mouth! I am looking forward to the almond horns. Wink. I too love Half Moon Bay and you reminded me that I need to pop over there soon! Hope you and your family have a great Thanksgiving Day Holiday! Beautiful cookies! Perfect with a glass of Vin Santo or a cup of coffee. Che belli Ricciarelli! Your cookies are beautiful! These have been a favorite of mine since I was little. Happy holidays to you! These cookies are so pretty! I love almond everything – I bet these are delicious! So beautiful! These sound perfect for the holidays, and just a bite of sweetness with my tea!!! Fantastic cookies and this is the holiday baking season. I like that you made your own almond paste. 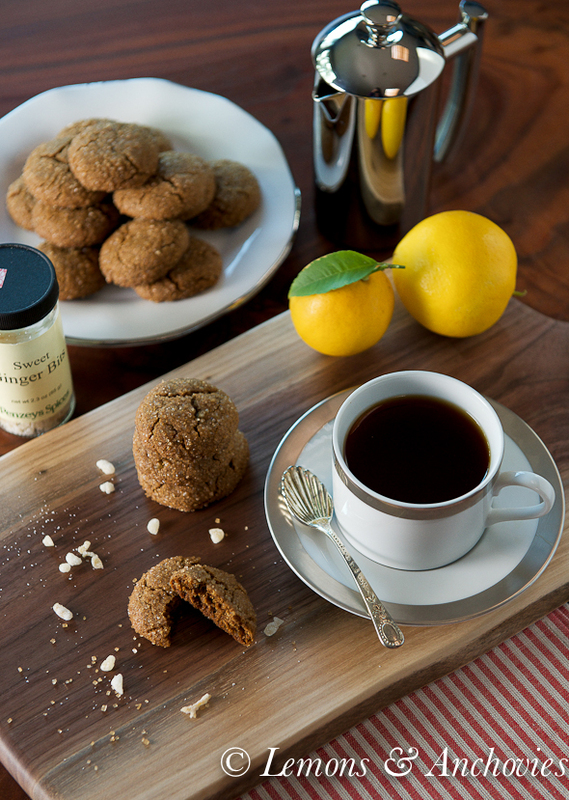 I love almond flavored cookies like these, they are just perfect with a cup of tea! Thanks for this outstanding recipe. I had just purchased these cookies at the Pasta Shop on 4th St in Berkeley earlier this week, I told the cashier they were for inspiration. I loved the flavor and sought out another box at Berkeley Bowl, but they were kinda dry. Then I found this recipe and they are by far the best. I only had a 7oz tube of almond paste, so I followed your directions for making my own and it came out so good, I plan to only use this homemade version when I make the cookies again. Julie, I’m so glad you liked this recipe and thanks so much for giving it a chance. Isn’t homemade almond paste so much better? And cheaper, too! Thanks for taking the time to give me feedback! !